Mirror, Mirror on the Wall, Who’s the Fairest One of All? If the mirror answers back, “One Who Chooses to Decorate with Mirrors”, it is on to something. But before I get ahead of myself, let us discuss what a mirror IS exactly. Technically it is any object that reflects light or sound in a quality similar to the original image. I personally use my mirror for pimple popping (ew, don’t tell), mascara applying, tie-tying, eyebrow plucking, self admiration, light reflection, and all around personal grooming. The object known as a mirror is often taken for granted considering that the first mirrors used were made of still water pools, polished obsidian stones, bronze, mercury plate glass (toxic) and silver-mercury substrates (sometimes toxic). The aluminum glass mirror, today’s standard, was not really introduced until the 1800’s, and not manufactured readily until the 1900s. A mirror has long been used in art. A mirror produces a replica, an illusion, and, in essence, a fake reproduction of an original. The mirrored image is actually an abstraction. A mirror, while utilitarian and functional, also conveys a sense of vanity, self reflection (literally), and introspection. Leonardo da Vinci called the mirror the “master of painters”. M.C Escher used mirrors of convex and concave shapes in order to more completely depict and understand his surroundings. Frida Kahlo’s, Durer’s, and Rembrandts famous self portraits came into being because of the help of a mirror! 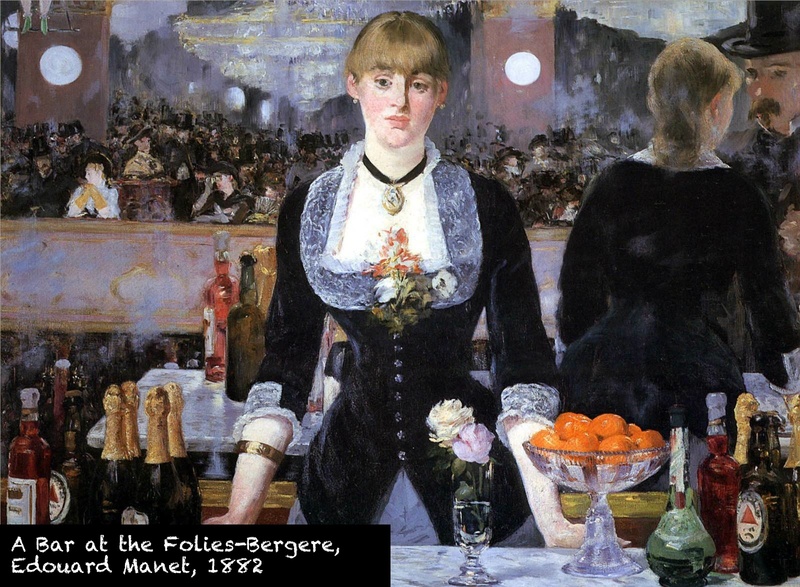 Édouard Manet’s A Bar at the Folies-Bergère intentionally features the trickery of a mirrors surface, using purposefully skewed angles . Jeffrey Meyers, in his Impressionist Quartet: The Intimate Genius of Manet and Morisot, Degas and Cassatt, describes the intentional play on perspective and the apparent violation of the operations of mirrors: “Behind her, and extending for the entire length of the four-and-a-quarter-foot painting, is the gold frame of an enormous mirror. The French philosopher Maurice Merleau-Ponty has called a mirror ‘the instrument of a universal magic that changes things into spectacles, spectacles into things, me into others, and others into me.’ We, the viewers, are looking at the barmaid, almost intimately gazing at her. We see the faceless French crowd, but we all see the man she is serving, then we realize this man is also where we would be in the mirror. 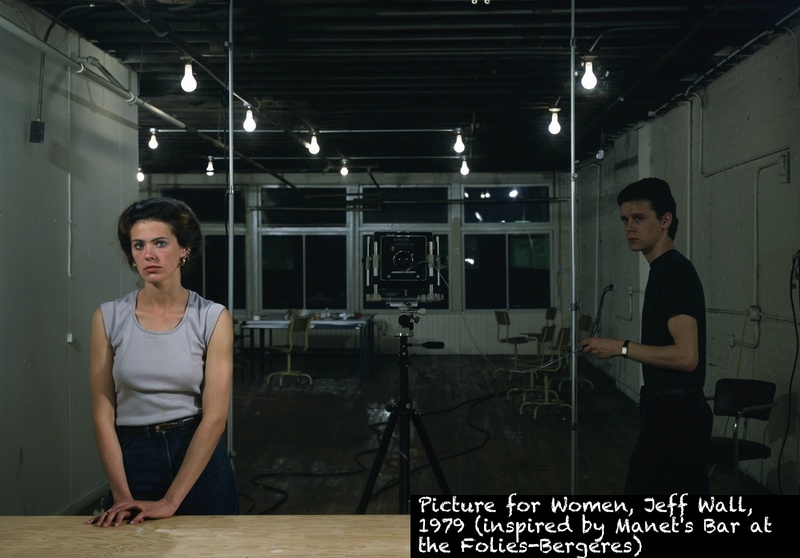 The woman looks forlorn, and bored, yet in the mirrored image her body image appears engaged and interested. Are we the top hatted stranger? Are we causing the barmaid her grief? The mirror gives a disconnected, refracted view of the world, a world wherein several planes of light exist. Our gaze is allowed several points of view – the barkeep, the man (ourselves), the audience, the customer. Given such inconsistencies, Manet seems not to have allowed a single, determinate position from which to assuredly make sense of the whole. The world as portrayed through a mirror. 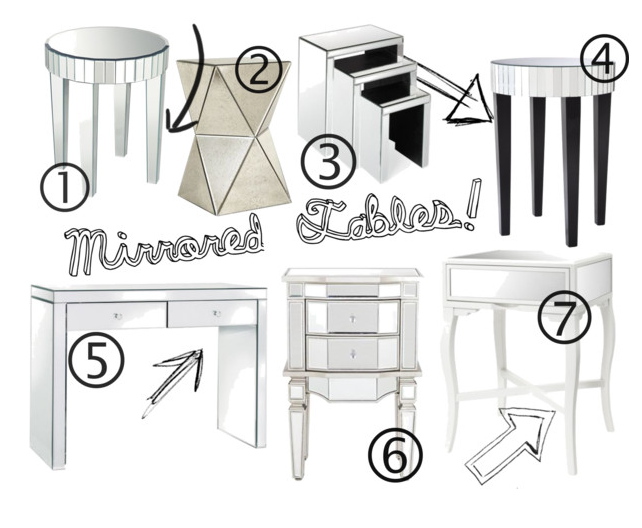 Mirrors, aside from providing a slight deception, and a beautiful abstraction, also help small spaces immensely. The mirror tricks the eye into believing a space’s depth is deeper than perceived. A mirror collects and beams light out, illuminating cavernous spaces and accentuating natural and artificial light. Place mirrors in any room that lacks natural light (Contrary to Popular Believe, they are not just for the dining room, bathroom, or entryway). Be careful with your experiments in luminosity – a mirror can cause unpleasant glares. 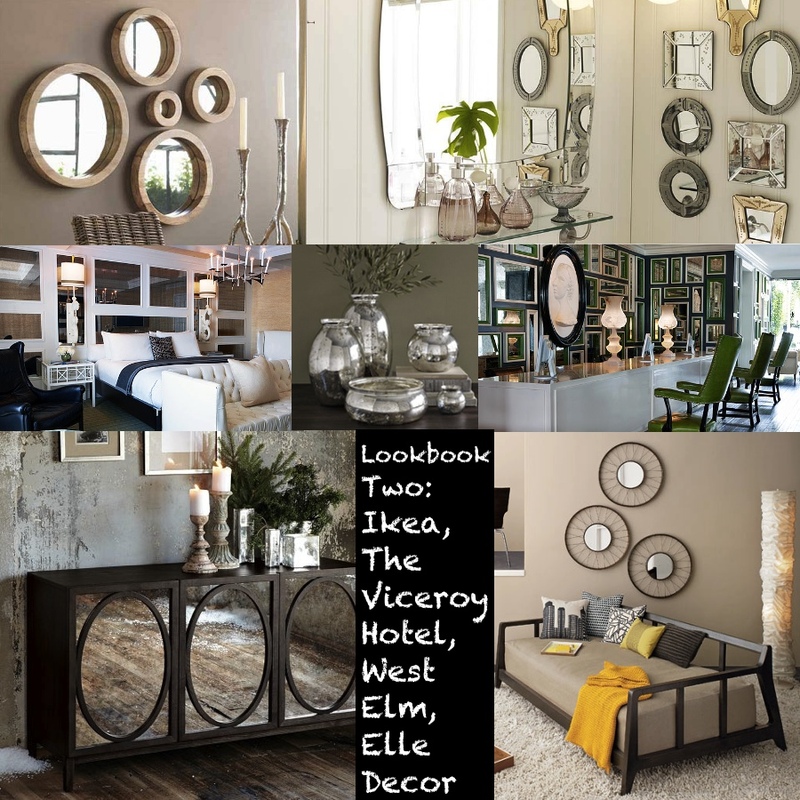 Treat a mirror like a moveable window, place it wherever you want depth, your guests gaze, and the illusion of expansion. Treat a mirror as a porthole into another room – place a LARGE mirror across an entire wall (in a small space) and watch the room transform into twice its size. Think of this effect in the last yoga or dance studio in which you’ve exercised. Although the rooms are always narrow, they seem to infinitely relay images, space, and people from wall to wall. Remember, a mirror does not always have to hang. 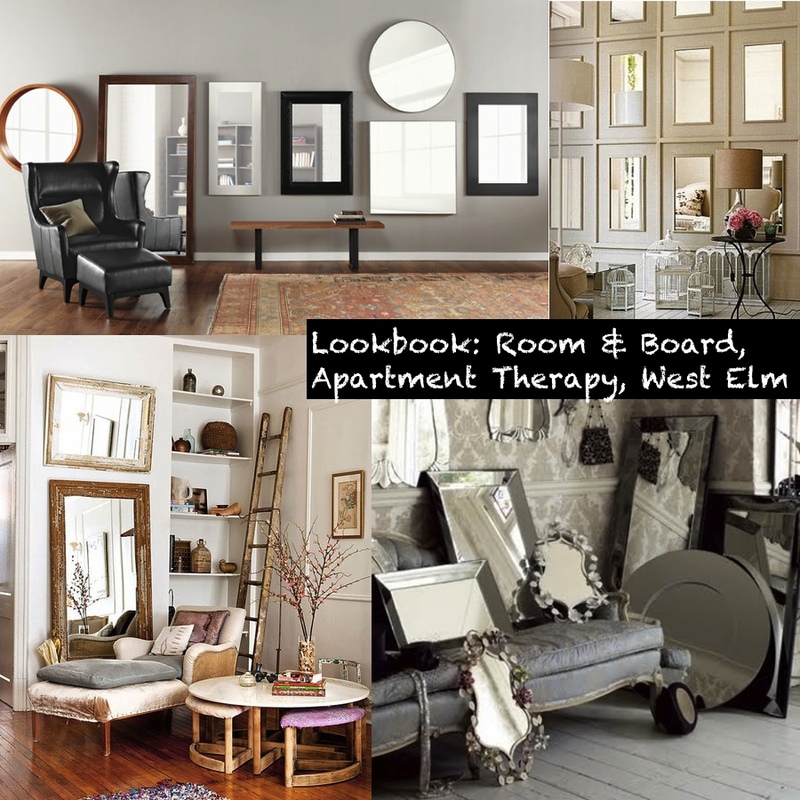 If you live in an apartment that bans nails on the the wall, or you are dealing with exposed brick, a floor length, mirror can be your “stand” in. If you are planning on creating a curious collection of several mirrors on one wall, make sure the mirrors are all similar sizes, otherwise the decor and reflections could get dizzying and a bit awkward. Whether one gazes through the mirror as Dorian Gray, Alice, Narcissus, or even Harry Potter – it is impossible to deny that the mirror might be the most important tool for artists (and decorators) since the paint brush!